Looking for a sweet, wholesome holiday musical? Well, this ain’t it! On Christmas Eve, little 8-year-old Davin is mistakenly taken down to Hell. When he returns, not only has he missed Christmas, but he is devilishly changed. To set things right, his father embarks on a bizarre odyssey that eventually leads him down to Hell itself where he makes a wager with Lucifer he can’t possibly win. 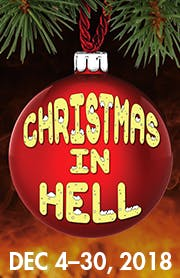 Christmas in Hell, with book, music, and lyrics by Gary Apple (“The Simpsons”), is a wild, irreverent, and surprisingly touching musical comedy about the absurd lengths we’ll go to for the ones we love. After award-winning appearances at the NY Fringe Festival and NYMF, Hell now arrives at The York for a full production, way more naughty than nice.